Since it all began in 1990, SICAB has become a single-theme Equestrian Trade Show, dedicated to a single breed and has converted into the most important in the world. Undoubtedly, it is the most important of all those held in Spain. Over the years, SICAB has enjoyed impressive growth to reach statistics that are far from insignificant. These show the true development of the equestrian sector in Spain as a generator of economic wealth and employment. Today, SICAB occupies 75,000 square meters (just over 800,293 ft2) of exhibit area at the Palacio de Congresos (Convention Center) in Sevilla. 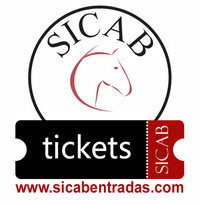 During SICAB, the Spanish National Championship Final for PRE Stallions and Mares is held, as well as the ANCCE Cup Final for the equestrian disciplines of Show Jumping, Doma Vaquera, Dressage, Carriage Driving, Alta Escuela as well as the Exhibition Competition and the Show. 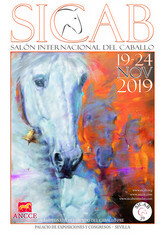 Thanks to all these factors, it can be said that SICAB has become a world class reference on the International Equestrian Calendar, where the Purebred Spanish Horse is the sole protagonist during a week of festivities in the autumn in the city of Sevilla. Since SICAB was created, the National PRE Breeders’ Association of Spain, which organizes the event, has enjoyed the backing of the Crown, personified in HRH Princess Elena, Duchess of Lugo, who has been the Honorary President of the event right from the beginning. Thus, Princess Elena expresses her love for equestrian art, her devotion for sports events and her unconditional support of the Purebred Spanish Horse. On a number of occasions, Princess Elena has inaugurated SICAB; on several occasions, she was accompanied by her grandmother, HRH, the Countess of Barcelona, who has since passed away. However, together with the Princess, a number of other public figures have, whether officially or privately, participated by visiting the various activities held during the International Trade Fair. These include: Mr. Manuel Chaves, Ms. María Teresa Fernández de la Vega, Mr. José Bono, Mr. Miguel Arias Cañete, Mr. Jaime Reynaud, Mr. Alfredo Sánchez de Monteseirín, Mr. Manuel Pimentel, Ms. Loyola de Palacio, Ms. Teófila Martínez, Mr. Javier Arenas, Ms. Elena Espinosa, Ms.Soledad Becerril, Mr. Paulino Plata, Mr. Jaime Mayor Oreja, Mr. Isaías Pérez Saldaña, Mr. Josep Puxeu and many other politicians of varying importance, who are customary visitors at SICAB. SICAB, dedicated in full to the Purebred Spanish Horse, is rooted in the PRE Spanish National Championships of old, which were held at Club Pineda in Sevilla. The first edition of these was in 1980 while the seventh was in 1986. That year, the sector suffered greatly as both commerce and sports were hit hard by the first outbreak of African Horse Sickness. Due to this, Spain closed its borders, suspended all commercial dealing of PRE horses abroad, as well as prohibiting the grouping together of equines throughout the country. Commerce abroad was closed until 1992, although the ban on the grouping together of horses was lifted to a certain extent in 1990. At that point in time, the National PRE Breeders’ Association of Spain (ANCCE) decided to bring together a few horses at the Palacio de Exposiciones or FIBES (Convention Center) in Sevilla for an event called EXPOGAN. That was the seed that germinated to become SICAB, although at that time, Spanish horses shared the facilities with other breeds. 1991 was a turning point as ANCCE and FIBES signed a collaboration agreement which guaranteed the future for SICAB, and ties were broken with EXPOGAN. This agreement granted SICAB with international projection. At that first edition of SICAB, two of the three pavilions at the Palacio de Congresos y Exposiciones (Convention Center) in Sevilla were used to house the 500 horses and twenty some commercial stands. Based on the success at all levels of this initial experience, the second edition was organized with sights set on expansion and innovation. Thus, in 1992, the event occupied all available surface space, while the show became a key aspect of the Trade Fair. From then on, SICAB continued to break its own records, from audience numbers to the number of participating horses and stud farms that came from all over Spain. Over the years, ANCCE became the sole organizer of the event, without the collaboration of the Convention Center. Today, the FIBES facilities are limited when hosting SICAB; therefore, restrictions have been imposed when it comes to housing the participating horses. Part of the parking area had to be reserved for the 5000 square meter (53,800 ft2) marquee needed as additional exhibit area. In 2005, yet another marquee was added. This 2000 square meter area (21500 ft2) houses a number of equestrian activities. This year, another marquee has been added to provide 4400 square meters (47300 ft2) of further equestrian activities.